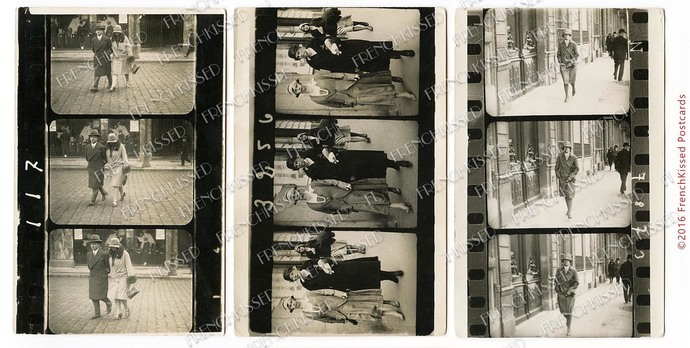 This is a trio of filmstrip triptychs of city folk walking around downtown buildings: a single woman, a couple, and three women. From the clothing styles, I'd dates these photo proofsheets to the Art Deco era, around 1920 to the 1930s. These 'filmstrips' have been printed on postcards. No writing verso on the 'carte postale,' so I don't have a clue as which French cities these were taken in. To get all three to fit on one page, I have reduced the size just a smidgen to 10.5 inches long and about 5 inches tall (instead of the typical 5.5 inches width of an antique postcard). Very retro and vintage. I cleaned up a few specks, but overall, I've left them wonderfully aged. Higher resolution available upon request. This image is 300 dpi at about 5 by 10.5 inches.